Quick Healthier Cinnamon Buns (Ready in 45 minutes!) - No Way That's Healthy! Cinnamon buns are my favorite baked good. Shockingly, since they don’t have any chocolate in them! 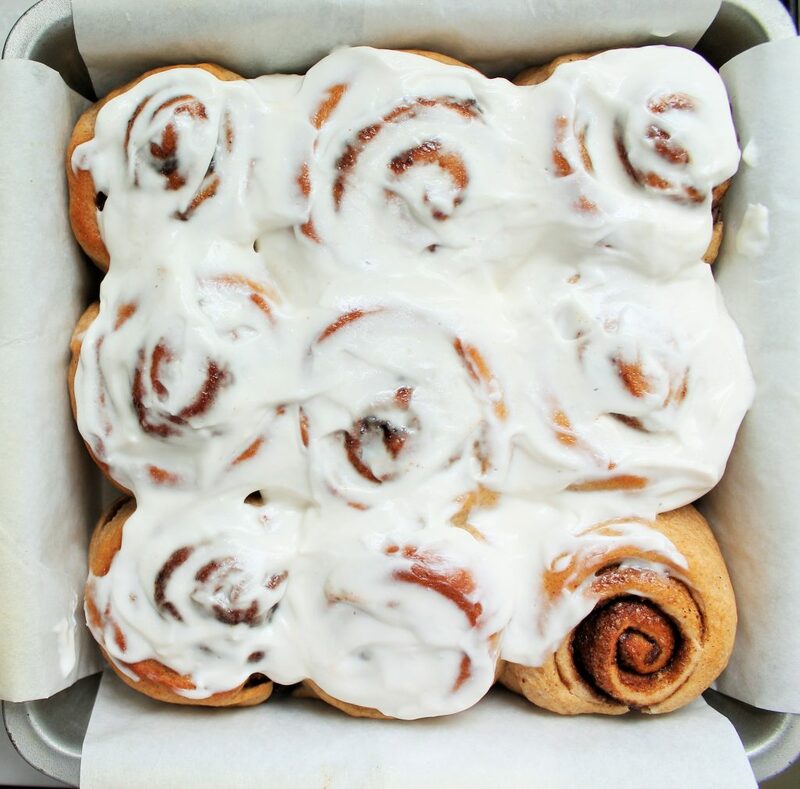 There’s just something about a warm cinnamon bun fresh out of the oven with that creamy cold cream cheese icing on top (say that three times fast!). What would make them even better would be if they were more wholesome than your average cinnamon bun and were super quick to prepare. Of course I had to make that happen and I’m excited to share it with you! The dough for these are adapted from my 30 Minute Honey Whole Wheat Rolls. Those are always a hit and I knew a similar dough would work out perfectly for cinnamon buns. I hope you give this a try and thank me later when your neighbors come running over because the smell coming from your house is too good to resist. You don’t have to tell them how easy it was to make, it can be our little secret. 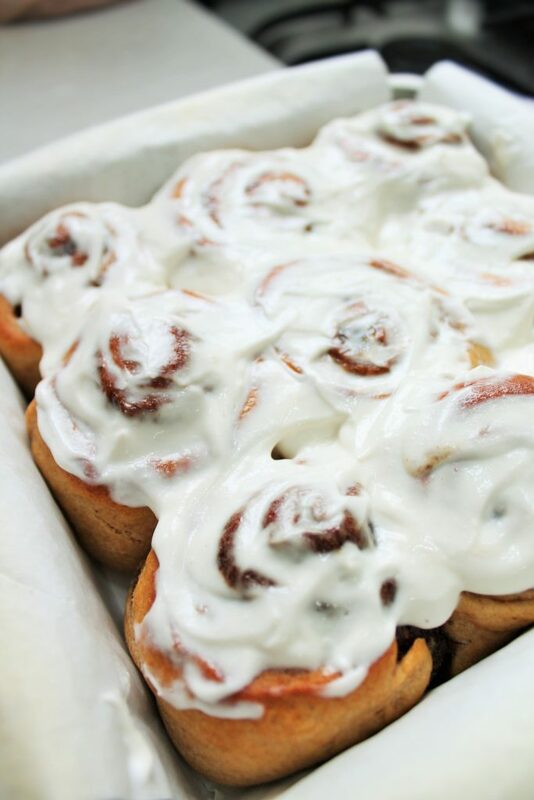 Cinnamon buns. Made in under an hour. And their healthier. Say no more! Run and make these now! Preheat oven to 375F and line two 8x8 baking pans with parchment. In a bowl mix together the warm milk, yeast, and honey. Let sit a few minutes till it starts to bubble, about 5 minutes. Next, add in the oil and egg. Mix. Add in the 3 cups of the flour with the salt and mix till the dough is well combined and still a little sticky. Add more flour if you feel it is too sticky. Do not add too much or it may turn out dry. Allow the dough to rest 10 minutes. Meanwhile mix together the cinnamon, sugar, and vanilla. Spray your surface with oil or nonstick cooking spray and remove half of the dough. Roll it out very thinly into a rectangle. Spread on a thin layer of coconut oil followed by a generous sprinkle of the cinnamon mixture. Use the rolling pin to roll over the dough with the mixture on top to push it a bit into the dough. Roll up tightly then slice into the desired size. Repeat with remaining dough. Place closely together into the baking pan. Allow it to sit for 5-10 minutes. Bake for about 15-20 minutes or till puffed up and slightly golden on top. Remove and allow to cool slightly before spreading icing on top. These are, of course, best fresh out of the oven. If you want to make them in advance that should be fine, but I recommend you do not ice until serving. Simply warm up then spread on icing. You may need to make more filling if you choose to add a lot.